Crystal Palace have signed Arsenal forward Yaya Sanogo on loan until the end of the current season. The 21-year-old Frenchman becomes new boss Alan Pardew’s first signing since taking over from Neil Warnock as Eagles manager, after leaving Newcastle United to take charge at Selhurst Park. Sanogo was also linked with a move back to his native France, after Ligue 1 outfit Bordeaux had reportedly expressed an interest in his services, but Arsenal manager Arsene Wenger opted to keep the young Gunner in the Premier League for the remainder of the season. Former Magpies coach Pardew was happy to accommodate the France Under-21 international in his fight to regain form as he searches for a prolonged career at the Emirates after his loan spell expires in the summer. For now, Palace have a young striker who has played five games for his parent club this season and netted just a single goal, which came against Borussia Dortmund in the Champions League. The new Eagles boss was full of praise for his new French frontman, stating that the acquisition can boost his side’s chances of avoiding relegation this term. “He’s a young player with tremendous promise,” said Pardew. Sanogo has struggled to break into Arsenal’s first-team, with a host of strikers regaining form and fitness after the Christmas period. Alexis Sanchez is in sensational form for the Gunners, netting 18 goals in 30 outings, and Olivier Giroud has also returned from injury and is pushing superb Sanchez for a run in the starting line-up. Sanogo’s fellow Frenchman has bagged six goals this term while Danny Welbeck has 12 in 29 appearances. Despite a lack of recent prowess in front of goal, Pardew feels his new striker just needs a run of games in order to find the goalscoring form which earned the French attacker a move to the Premier League. “We have given him an opportunity. He needs to play more games and I think he’s ready for that and he proved that at Arsenal,” Pardew continued. Despite a lack of action for Wenger’s men this season, Sanogo, who came through Auxerre’s youth system, was part of the Arsenal side that lifted the FA Cup last May, and also won the community Shield this season. During his time in France he scored 11 times in 24 appearances for Auxerre, and has won eight caps for the French Under-21 international side, bagging five strikes in the process. 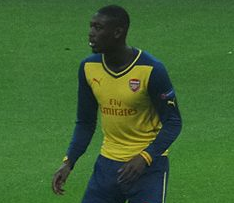 Sanogo has also picked up the FIFA Under-20 World Cup with Les Bleus. Palace will hope that Sanogo can boost the London club’s chances of avoiding relegation, with Palace struggling down in 15th spot, only a single point safe of the drop zone.